KINGSFORD---The Escanaba High School baseball team made six errors, including four in one inning, and lost to the Kingsford American Legion team, 8-7, Thursday night at Kingsford's Spigarelli Field. The loss was the second ugly one in a row for the Eskymos, who also lost to Marinette High School on Tuesday in another error-fest. "We can't give teams extra outs all the time and think that we can get away with it," Escanaba Head Coach Kirk Schwalbach said. "When we play well, we can play with anyone. But when we play bad, anyone can play with us." Devin Olsen got a no-decision Thursday. Eskymo sophomore Devin Olsen pitched well, throwing 85 pitches over five innings and allowing just one earned run. He left with a 7-3 lead, and it looked like the Eskymos would cruise to the win, needing just six more outs to get it. But relief Andrew Sedlar was touched up for three runs in the sixth inning, as a combination of Kingsford hits and Escanaba mistakes made for a tough inning. Then, in the bottom of the seventh, with the Eskymos clinging to a one-run lead, senior Austin Young was brought in to pitch. Things still looked good when the Eskymo defense got an out at the plate, but 16-year-old Mike McCole ripped a two-run double to win the game in walk-off fashion for the Blues. 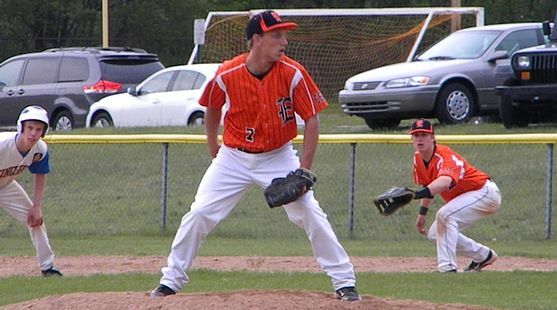 Escanaba had ten hits in the ballgame, but no production from the top of the order. Sophomore Cam Beversluis and freshman Tyler Skufca both had three hits for the Eskymos at the bottom of the order. Click the thumbnails in the ARTICLE HIGHLIGHTS box to see more photos from the game, taken by Holly Bockman.